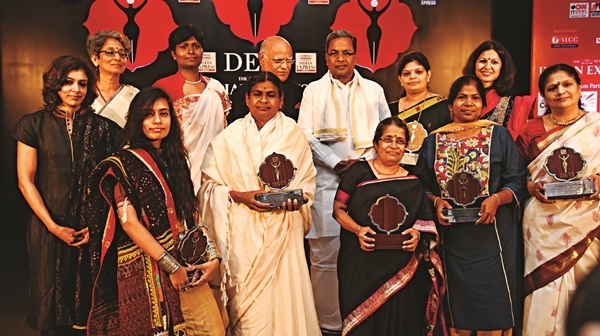 Following the success of the Devi Awards in New Delhi last December, and in Hyderabad earlier this year, The New Indian Express hosted the Bengaluru edition last week, which saw 10 women achievers from across Karnataka being lauded for their dynamism and achievements in fields as varied as medicine, arts, social services, and law and order. The programme began with a welcome speech by the companya��s editorial director Prabhu Chawla, followed by a keynote address by the chief minister, Siddaramaiah, before the winners were felicitated. The lovely ladies stole the show on stage, and the party moved from the Mysore Hall at the ITC Gardenia to the banquet area. The bar, courtesy Madhuloka, encouraged a lot of conversations as the cocktails kept the guests rather busy. Apart from the award ceremony, guests were also part of a lucky draw that saw a select few win Nikon cameras from Byas Foto World, Hyderabad, an organic Pashmina shawl from Neesha Amrisha��s Aeshaane, and a hamper from Amrut featuring two of their most popular single malts. The dinner was equally lavish, with ITC Gardenia being more than indulgent, and laying out a spread that included Mediterranean, Burmese and Indian delicacies, and not to mention the decadent desserts. Keeping with the theme of girl power, the ladies were surprised with a goody bag from VLCC to take home, which ensured that they were pampered well after the curtains came down on the event.